Experienced cooks will love this set of stainless steel cookware. All you have to do is lift a piece to feel the quality construction. The heavy, seamless bottom is easy to clean and prevents hot spots, while the brushed stainless steel exterior looks pretty while hiding occasional smudges. The interior is polished stainless steel that’s nonreactive, so it won’t rust or discolor. The long handles stay comfortably cool during cooking and have hanging holes for storage on a pot rack or pegboard, and the stainless steel lids are durable. These pots have an aluminum core wrapped in stainless steel that helps these pots react to heat changes while still retaining and conductive heat for intuitive cooking. When you want to start cooking and move the pots to the oven to finish, these are oven safe to 550 degrees and when cooking is done they’re dishwasher safe for easy cleaning. This set includes a 1 1/2 saucepan with lid, a 3-quart saucepan with lid, an 8-inch skillet, a 10-inch skillet, a 3 1/2 quart covered sauté pan, an 8-quart stock pot with lid, and a steamer insert with lid. These are induction compatible. Everyone knows that nonstick frying pans are great for cooking eggs, but nonstick materials have come a long way, making nonstick cookware appealing for more than just breakfast. Since foods can burn if they stick to the bottom of a pot, the nonstick surface helps prevent that, no matter what you’re cooking. Nonstick pots and pans are also much easier to clean than their uncoated counterparts. And these nonstick pans can even be used for browning and sautéing foods. Even better, they’ve been restaurant-tested to make sure they’re metal utensil safe, but you should still avoid cutting in them or scraping them aggressively. This set is made from anodized aluminum, so it’s responsive to heat changes while the thick bottoms eliminate hot spots. The lids are shatterproof glass so you can see inside the pots without lifting the lids, and the handles are covered with a non-slip material that stays cool during cooking. When you want to move from the stove to the oven, these are oven safe to 400 degrees. This set includes a 1 1/2 quart saucepan with lid, a 3-quart saucepan with lid, and 8-quart stockpot with lid, an 8 1/2 inch French skillet, a 12-inch deep skillet with lid, and a 3 quart covered sauté pan. These are not induction compatible. Still can't decide on what you want? Our round-up of the best nonstick cookware sets can help you find what you're looking for. This wallet-friendly set is perfect for someone setting up a first kitchen on a budget, for a college kid in an apartment, or for that vacation cottage or rental. The cookware in this set skews towards the small end of the volume spectrum, with more small pieces than large, so it’s better for singles and couples than for large families. The cookware is made from polished stainless steel and has tempered glass lids with steam vent, so you can see the food without lifting the lids. The aluminum disk on the bottom helps to regulate heat, while these are still induction compatible. These should not be used on high heat on the stove to prevent warping and discoloration. They are oven safe to 350 degrees, which is less than other sets but still sufficient for most oven cooking. While these are dishwasher safe, the surface can become dull with repeated trips to the dishwasher, so hand washing is recommended. When you’re cleaning by hand, rough abrasives and steel wool should be avoided. This set is definitely a splurge. Since these are pieces you’re likely to use most often, it makes a great starter set for an experienced cook or a perfect upgrade for an existing set. The set includes a 10-inch frying pan, a 3-quart saucepan with lid and a 3 quart sauté pan with lid. The tri-ply construction means there is an aluminum core surrounded by sturdy stainless steel for the best combination of responsiveness to heat changes, along with even heating and good heat retention. The exterior is polished stainless steel while the interior is polished with a starburst pattern that helps reduce food sticking. The lids are sturdy stainless steel with loop handles that are easy to grab. The long handles stay cool during cooking and have hanging holes so you can display them on your pot rack or hang them on hooks in the pantry. These are oven and broiler safe to 600 degrees without the lids, and they are induction compatible. Cast iron cookware has been around for a very long time, and it’s still quite popular, particularly for searing and frying. The metal heats slowly and retains heat well, so it won’t cool down a lot when you add food. The handles can get hot during long cooking, so mitts or potholders are a good idea. There are also covers that can be put on the handles if you prefer. Cast iron is very durable and can be handed down through generations. Even better, it can be used on any type of stove, it’s oven safe, and it can even be used on your grill. While this cookware comes pre-seasoned, additional seasoning and continued cooking will make the seasoning even better. A properly seasoned cast iron skillet can even be used for cooking eggs, just like a nonstick skillet. Seasoning cast iron isn’t difficult, but if you’ve never done it before, it’s a good idea to follow instructions for both seasoning and cleaning. This set includes an 8-inch skillet, a 10 1/4-inch skillet, a 10 1/2-inch griddle, a 5-quart Dutch oven, and a lid that will fit either the Dutch oven or the larger skillet. Read more reviews of the best cast iron pans available to purchase online. Perfect for people who like the idea of nonstick cookware but don’t want anything that might include Teflon, this attractive set is made from hard anodized aluminum and has a white ceramic interior that’s both durable and nonstick. The handles are stainless steel and the lids are durable glass with vent holes so you can see the food without lifting the lid. 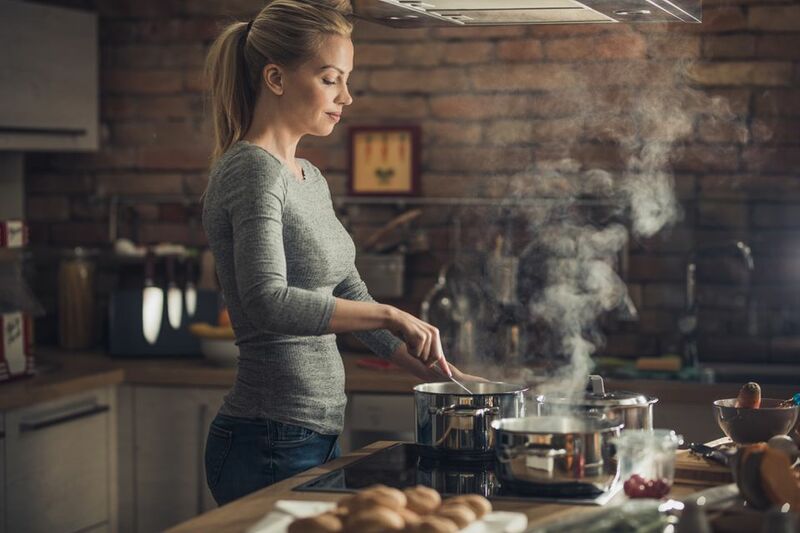 Measuring marks inside the cookware lets you add water or other ingredients without needing a measuring cup while pouring spouts and strainer lids make it easy to drain liquids without losing your food down the drain. This cookware is oven safe to 450 degrees. To prevent scratching, you should use soft utensils like silicone, nylon, or wood with this cookware. This set included an 8-inch frying pan, a 10-inch frying pan, a 12-inch round griddle, a 1 1/2-quart saucepan with lid, a 2 1/2-quart saucepan with lid, a 3-quart sauté pan with lid, and a 5-quart Dutch oven with lid. Take a peek at some of the other best ceramic cookware you can buy. Perfect for small kitchens or for anyone who is short of storage space, this set is built to stack and nest. Even better, you can arrange the pieces in any order, so your least-used pots can stay at the bottom while your favorites can rest on top where they’re easy to grab first. These are made from hard anodized aluminum with a nonstick interior that’s safe for use with metal utensils. The long handles stay cool during cooking and have hanging holes if you want to hang a few pieces on the pot rack or on the pegboard in the pantry. The lids are flat for easy storage and they’re made from tempered glass so you can see the food while it cooks. This set includes an 8-inch frying pan, a 10-inch frying pan, a 3 1/2-quart saucepan with lid, and a 3-quart sauté pan with lid. This set is oven safe to 450 degrees, but it not induction compatible. For easy cleaning, it is dishwasher safe. A steamer can be very handy to have, whether you’re cooking vegetables, steaming hard boiled eggs, or gently steaming seafood. While you certainly can hunt down a steamer that might fit your current cookware set, it can be hard to find one that’s the perfect fit. This set includes its own steamer, and it is designed to fit both saucepans, making it even more versatile. These have an aluminum core covered with stainless steel for even heating, good responsiveness, and no hot spots, and the lids are sturdy stainless steel with large loop handles. The cookware is oven safe to 500 degrees, it can be used on induction cooktops, and it is dishwasher safe for easy cleaning. This set includes a 1 1/2 quart saucepan with lid, a 3-quart saucepan with lid, an 8-quart stockpot with lid, a 4-quart sauté pan with lid, and a steamer insert with lid. We bought five top-rated cookware sets that our reviewers tested for 70 hours. We asked our testers to consider the most important features when using these cookware sets, from from their heat retention to their durability. We’ve outlined the key takeaways here so that you, too, know what to look for when shopping. Material Besides aesthetics, the material affects the way the cookware functions. Copper is extremely responsive, so the pan reacts quickly when you raise or lower the heat. Cast iron takes a bit of time to heat up or cool down. Stainless steel falls in between those extremes and is very easy to keep clean. Today, you can find cookware made from multiple materials to take advantage of their special properties. Size It’s great to have a variety of cookware sizes, so you’re not heating a giant stock pot when you only need enough water for a pound of pasta, but it’s important to make sure the set you choose isn’t too small or too large for your family or your cooking style. ﻿Coatings Nonstick coatings are great for cooking eggs or other sticky foods, and they make cleaning easier when you’re washing by hand. On the other hand, nonstick coatings are usually not as durable as plain stainless steel, and may not be dishwasher safe. Besides interior coatings, some cookware may have enameled or anodized exterior coatings. If you’re looking for a solid cookware set that retains heat, the Cuisinart MCP-12N Multiclad Pro Stainless Steel 12-Piece Set should be your go-to choice, according to our testers. Our reviewers loved the weight of each piece in this set and noted that the non-heating handles are long and easy to grip. “The transition from stovetop to oven is always great,” one of our testers said. Plus, everything is durable: “Short of taking a hammer to it, or running it over with a truck, there's no reason it would fail,” one of our reviewers said of the set. One of our testers cautioned that these pots and pans heat up faster than you may expect—which is good as long as you are familiar with cooking with stainless steel. And if you do accidentally get some stuck on food (which is inevitable), one of our testers suggested using Bar Keepers Friend to get it off quickly. This cookware set was an immediate hit with one of our testers because its pans were very easy to clean: “A little soap and water with a very light touch was all I needed to remove solid food, sauce, and cheese—even when left overnight,” she explained. Our reviewers also thought the pans heated food evenly and were well made. 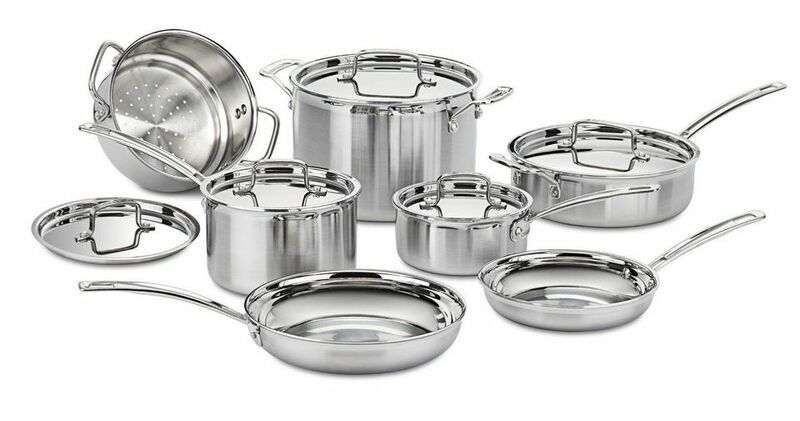 “The sizes and shapes of pans in this set are all very useful,” noted one of our testers. In addition, one of our reviewers said, “There are a lot of smaller-capacity pieces, which makes this less useful for families.” Overall? “While serious cooks should ignore this set, it fits a niche for people whose needs are simple, or in situations where the cookware will be used short-term or only occasionally,” summed up one of our testers. One of our testers — who made a variety of dishes including soup, stir fry, pasta, meat, and fish — reported that this set was easy to clean. He also thought it cooked food evenly: “I always believed that Teflon cookware was needed for things to not stick, but this All-Clad set prevents food from sticking and cooks the food very well by distributing heat evenly.” Another plus, according to one reviewer, was its durability after weeks of consistent use: “All of the cookware looks great — still shiny and no scratches,” he noted. On the other hand, our testers felt that the set was heavy but acknowledged that its sturdiness likely contributed to its great quality. One of our testers called this cookware set a “great introductory set to cast iron.” The set was also praised for its excellent heat retention: “I cooked steak multiple times,” explained one reviewer, “and got amazing sears with the hot cast iron.” The pans also performed well in the oven, according to one of our testers: “It was amazing being able to take one from the stovetop straight into the oven to broil or bake dishes,” he said. However, because cast iron tends to be high maintenance, this set required “intensive cleaning,” according to one reviewer. Another downside for our testers was how heavy the set was—especially the dutch oven.